1. This scholarship is based on actual examination results only. Forecast or trial results will not be accepted. 2. 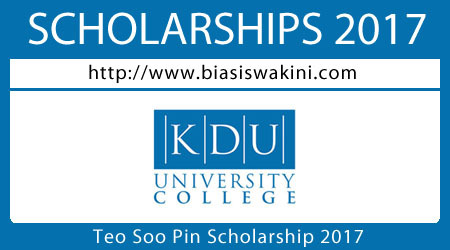 Applicant must be enrolled as a student of KDU University College or KDU College, Selangor and pay the full enrolment fee to be eligible to apply for the scholarship. 3. The deadline for scholarship application with submission of all relevant documents is 30 April and 30 August 2017. 4. Only shortlisted candidates will be contacted for an interview within one month after the application closing date. All shortlisted candidates are required to attend an interview. Failure to do so will result in disqualification of application. Only successful candidates will be notified of the outcome after the interview. 5. All fees paid are non-refundable, regardless of the outcome of the scholarship awarded. 6. Successful recipients are required to maintain a minimum CGPA of 3.5 (or equivalent) throughout their duration of study in order to maintain their scholarship. 7. The scholarship is only valid for the programme in which the recipient has enrolled in and for the original duration of study in KDU College or KDU University College, Selangor only. In the event the recipient changes programme or transfers to another KDU campus in Malaysia, the scholarship will be terminated. 0 Komentar untuk "Teo Soo Pin Scholarship 2017"